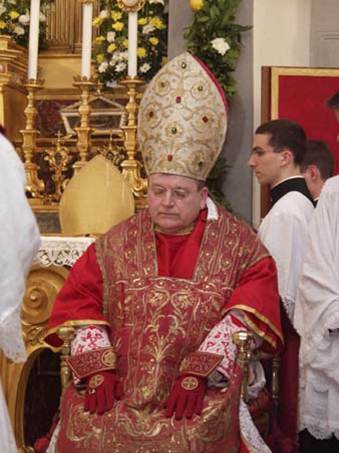 This weekend we have a bit of a flashback to an earlier posting about Cardinal Raymond Burke. One of my readers, a good friend in London, suggested that I re-post an earlier piece about the former Archbishop of Saint Louis and recently-removed Prefect of the Supreme Tribunal of the Apostolic Signatura. Cardinal Burke has become a strong critic of theologians, like Cardinal Walter Kasper, who would would argue that change has been and must be an important part of Catholic belief and practice. Burke is in fact a strong defender of what I would call “flashback Catholicism”……..more anchored in the late medieval past than the third millennium. Flashback Catholicism is at the heart of the storm, now blowing through the Vatican — and certain foreign outposts with flashback archbishops like Philadelphia — as “progressives” battle “conservatives;” and people like Cardinal Raymond Burke accuse the Pope Francis of fostering confusion about church teaching. February is World Fashion Month. It is with feelings of great emotion that I announce that Cardinal Raymond Leo Burke — born and raised in Wisconsin, USA — has won the 2011 “Look Sharp for Jesus Award.” The judges found him one of the best dressed members of the Roman Pontifical Court. There is of course no cash connected with this award because — well — we just don’t think he needs it after what his threads cost all of us in the church. Raymond Leo Burke — “Ray” to most of us — was born June 30, 1948. Heck, John Greenleaf was already riding his tricycle when little Ray was in diapers…… Ray is the current Cardinal Prefect of the Supreme Tribunal of the Apostolic Signatura. That’s a big job for a big man. Ray previously served as Archbishop of St. Louis (2003–2008) and Bishop of La Crosse (1994–2003). Aside from his judicial expertise and his great fondness for the medieval liturgy of the Council of Trent, Ray is quite the party boy in Rome. Wherever he goes, people stand in awe at his expertly crafted and tailored episcopal dress. You need a big hat — called a mitre. Ray has quite a collection. This colorful head cover is one of Ray’s favorites. “THE hat” for special occasions, like going out with the Pope. It cost Ray only $8,340. 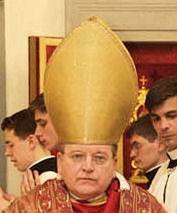 On less formal, but certainly still very important occasions, the Cardinal Prefect prefers his simple gold bonnet. This one below was a great buy at $1,042. But a mitre does not make a bishop…or a cardinal…..Pontifical GLOVES do the real trick. These beauties — great in a suddenly unexpected Roman snow storm or for shoveling snow back in Wisconsin — were a great buy at $1,390.